On September 13, 2001 Capcom Japan announced the Biohazard remake. Their plan was to re-release the original Resident Evil game, only this time they were armed with much superior technology. Their goal was to re-create Shinji Mikami's dream of true survival horror as he would have originally intended it. As more details arose, it was announced that the game would be exclusive to the Nintendo Gamecube. This came as a disappointment to many fans, especially fans who had already purchased a Playstation 2. Some cried foul stating that they were promised the game on the PS2 platform. Gamecube owners however, couldn't have been happier. Nintendo couldn't have been happier. Bringing a game of this nature to the Gamecube was good for Nintendo, it helped their effort to remove the "kiddie" image that they have been cursed with since the days of the original Super Mario Bros. 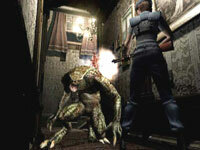 The original Resident Evil is viewed by many as the beginning of the survival horror genre. But, as revolutionary as the game was for its time, it also lacked in certain areas. The first thing that comes to mind is the terrible voice acting. Say "Resident Evil 1" to someone in the Resident Evil community, and you're bound to discuss the bad voice acting. No where is it more evident than in the opening movie sequence which depicts the live actors playing out the scene where S.T.A.R.S. members try to make it into the mansion alive. Also, the game was limited by the graphics power of the original playstation. Again, for its time it was good, but compared to the power of today's gaming technology, Capcom knew that they could do better. Thus we have the remake. Capcom really did an excellent job re-creating the original story, and when we talk about the improvements that were made, it's like comparing night to day. The new character models are very detailed, and much more life-like. The backgrounds are have improved vastly, each set more realistic than ever. Harnessing all of the power of the Gamecube and displaying to its fullest capabilities. And of course there's even more gore, which is what the true Resident Evil fan lives for. The remake also promises new scenes, new sounds, and even more surprises. 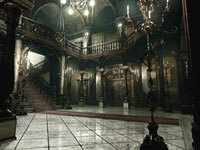 The Resident Evil remake wont disappoint.